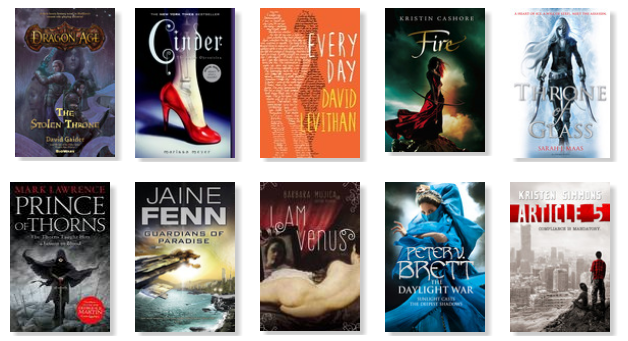 Last month I read a total of thirteen books – an improvement on February! Bitterblue (Graceling #3) by Kristin Cashore, The Book Thief by Markus Zusak, Fangirl by Rainbow Rowell, Leviathan Wakes by James S.A. Corey, Forgive Me, Leonard Peacock by Matthew Quick, In Real Life by Cory Doctorow and Jen Wang, The Cruel Path by David Normoyle, Doctor’s Notes by Dr. Rosemary Leonard, The Sisters Brothers by Patrick DeWitt, The Children of Hurin by J.R.R. Tolkien, Fantastic Four Vol. 1 by J. Michael Straczynski, Wards of Faerie (Dark Legacy of Shanarra #1) by Terry Brooks and X-Men Legacy: Aftermath by Mike Carey. Standout books include Bitterblue, The Book Thief and Fangirl. I was happy to finally read the conclusion to Kristin Cashore’s Graceling series, and Bitterblue tied the threads of the first two books together nicely. I read The Book Thief as I’d like to go and see it in the cinema, but haven’t quite gotten round to that yet! And finally, I won Fangirl in Lianne’s giveaway, and it was an absolute delight. You can read more about how it surprised me in my review. I’ve now read thirty-six books towards my goal of fifty this year. I may think about raising it in June or July. I read eight books towards the Avengers vs. X-Men Challenge, which I’m very pleased with! I also managed to defeat this month’s villain, Juggernaut. April’s villain is Kingpin, who looks to be quite a challenge. One book ticked off of the Dragons & Jetpacks Ultimate Booklist, which also happened to be our science fiction Book of the Month. I shared some gateway fantasy books for those new to the genre. My regular feature Turning Off The TV covered Tron Legacy, Supernatural, True Blood and BBC’s Merlin. I spoke about how I often judge a book by its cover – and it seems many of you do too! I shared my experience on the Harry Potter Studio Tour: Part One and Part Two. I discussed some bookish habits, and many of you shared yours with me as well! I fangirled over the amazing Dragon Age series with my lovely friend Paola. And I was also featured at Pages Unbound for Tolkien Reading Week! Quite a few reviews including Leviathan Wakes, Doctor’s Notes, In Real Life and The Cruel Path. And more Museum of Literary Wonders posts as I’ve been meaning to do for a while! Not much has happened! I’m kind of scared and excited at how quickly this year has gone so far. Only four and a half months before I move to the Netherlands for university. I can’t wait! I’ve also started playing Smite with a friend, it’s an MOBA where you play as gods – perfect for a mythology geek like me, though I keep pointing out the flaws within the system… it’s really fun though! As for the coming month: my mum is running the London Marathon and I’m SO proud of her. She’s running for a charity called WellChild and has raised a fair amount of money so far. And at the end of the month, it’s back to London again for a cocktails & conversation event with Laini Taylor and Lauren Owen – are any of my fellow book bloggers going as well? Last month I read a total of eight books – less than January, but no novellas or graphic novels this time. Cash: The Autobiography of Johnny Cash (with Patrick Carr), Ancillary Justice by Ann Leckie, Everything is Illuminated by Jonathan Safran Foer, She Is Not Invisible by Marcus Sedgewick, Lockstep by Karl Schroeder, Paper Towns by John Green, The Final Empire by Brandon Sanderson and The Gospel of Loki by Joanne M. Harris. Standout books include The Final Empire, The Gospel of Loki and Cash: The Autobiography of Johnny Cash – one of my favourite musicians ever, his life was absolutely fascinating to read about. I’ve now read twenty-three books towards my goal of fifty this year, but I’m unsure about raising it just yet. Another one ticked off of the Dragons & Jetpacks Ultimate Booklist Challenge, which handily also happened to be February’s Fantasy Book of the Month! I’m slowly finishing off my TBR Pile 2013 Challenge – I achieved my goal for the year last year, but I had a list of thirty books, and aimed to read at least fifteen in 2013. Now I want to read the rest throughout 2014. And finally, the Review Copy Clean-up Challenge! I read three review copies this month, which isn’t quite as many as I’d hoped to – but my Netgalley ratio is now 55.5%, which is a bonus. I still have to review one of the books, although that one was from Goodreads. The end of February didn’t see too much action, as I’ve been ill for the past week with a throat infection, and now a cold. I missed two and a half days of work (which I hate doing), but I should be fine to go back on Monday, which is good! I took part in Insta-Love 101 hosted by Novel Idea Reviews. I discussed why insta-love just doesn’t work. I recommended some books for Doctor Who fans. In my last Fantasy Friday of the month, I discussed some fantasy holiday destinations. I took part in the blog tour for the Book of Apex Volume Four, and the posts for that included a guest post by Adam-Troy Castro, an interview with Rahul Kanakia and an interview with Adam-Troy Castro. Thanks to Andrea for hosting it! The Museum of Literary Wonders opened up for a second tour of the artefacts. I discussed just why I love video games. And finally, I joined the Review Copy Cleanup hosted by Vicky & Celine. A couple of reviews, including She Is Not Invisible by Marcus Sedgewick and The Final Empire by Brandon Sanderson. A post about my time at the Harry Potter Studio Tour, which I visited on 19th February! The usual discussions and features will return, minus Weekly Roundup which has become rather infrequent as I’m trying to not buy books. CRAZY, I know. Well as I mentioned, I was ill at the end of February… I had really bad tonsillitis in November (during Sci-Fi Month!) so I was really worried it would be another case of that – but luckily it was just a throat infection and cold. Earlier in the month I visited the Harry Potter Studio Tour with one of my best friends which was amazing, but more on that in another post! I then had another best friend to stay for a few days, and it was so lovely to see her – we met up with another friend from uni and had a lovely day out at a National Trust place nearby, then went out for tapas in the evening. I’m really quite scared at how fast the year is going, see as I’ll be moving to the Netherlands in mid-August and I have a LOT to sort out before then. Better get on it! And that was my February! I remember writing up the Review Copy Cleanup post quite clearly, so I think it’s gone a *little* too quickly for my liking. How was your month? Every first Wednesday of the month, I’ll be posting a roundup of the month just gone, and writing about what’s to come in the next few weeks. This is replacing my Exciting New Releases feature, which may be integrated into this one. I read ten books this month. Dragon Age: The Stolen Throne (Dragon Age #1) by David Gaider, Cinder (The Lunar Chronicles #1) by Marissa Meyer, Every Day by David Levithan, Fire (Graceling #2) by Kristin Cashore, Throne of Glass (Throne of Glass #1) by Sarah J. Maas, Prince of Thorns (Broken Empire #1) by Mark Lawrence, Guardians of Paradise by Jaine Fenn, I Am Venus by Barbara Mujica, The Daylight War (Demon Cycle #3) by Peter V. Brett and Article 5 (Article 5 #1) by Kristen Simmons. Which meant that by the end of September, I had read 68 out of 75 books for the 2013 Reading Challenge! I wrote up our thoughts on Ender’s Game and Prince of Thorns. We chose Elantris and Ready Player One as Octobers Books of the Month! I bought a total of eleven books, borrowed six and received two from the publisher. I won Anya’s Brandon Sanderson giveaway, and chose Elantris as my prize! I joined Leanne’s Horror October event, and The Journey Home, a celebration of the Lumatere Chronicles hosted by Charlene and Paola. I started a new science fiction and fantasy based challenge. I posted my first Fantasy Friday post, a new feature that I’m hosting every two weeks. The next will be this Friday. I updated my readers on Sci-Fi Month, which is coming in November – and you’re more than welcome to join in! A couple of reviews, including Every Day by David Levithan and Aphrodite: Goddess of Love by George O’Connor. My Horror October posts, every Tuesday this month! My schedule is here. My account of the Cheltenham Literature Festival – this weekend I’ll be seeing/meeting David Levithan, Sarah J. Maas, Maureen Johnson, Patrick Ness and Meg Rosoff, then Mary Beard next Sunday!